Sen. Olympia Snowe, R-Maine, speaks to media outside her office on Capitol Hill in Washington, Tuesday night, Feb. 28, 2012, about her decision not to run for re-election. 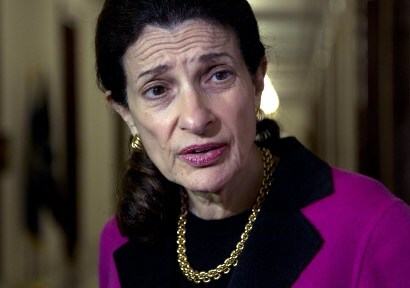 U.S. Sen. Olympia Snowe stunned Maine’s political establishment on Tuesday by announcing she would not seek re-election in a decision likely to have ramifications on both congressional races here and on the battle for control of the U.S. Senate. Snowe, a moderate Republican who wields considerable power on Capitol Hill, said she reluctantly came to her decision to end her 33-year career in Congress after determining that the partisanship that dominates Washington, D.C., was unlikely to change. But the surprise announcement appears to have upended Maine’s other major elections. Both Democratic U.S. Reps. Chellie Pingree and Mike Michaud as well as Michaud’s challenger this November, Republican Senate President Kevin Raye, indicated that they were all now eyeing Snowe’s seat. And other candidates are likely to join the first race for an open Senate seat in Maine since 1996. Snowe, who would have been seeking a fourth term this November, said she and her husband, former Maine Gov. John McKernan, were in good health and that she had little doubt she would have won re-election. But Snowe, 65, also spoke to the partisan rancor that has come to characterize Washington. Despite the criticisms, many pundits believed Snowe would handily win re-election this November. Until Tuesday, Snowe had never given any indication — publicly, at least — that she did not hope to serve another term in the Senate. She had hired a campaign staff, appeared at GOP caucus meetings throughout the state earlier this month and had amassed a campaign war chest of more than $3.4 million as of the end of December. President Barack Obama also weighed in, joining a chorus of political leaders from all parties praising Snowe for her service. It was the first such presidential statement by Obama for a retiring Republican, according to veteran NBC reporter Chuck Todd. Snowe’s announcement also took Republican leaders completely by surprise; she informed Senate Minority Leader Mitch McConnell and National Republican Senatorial Committee Chairman John Cornyn of her decision Tuesday, The Washington Post reported, quoting a person familiar with the decision. Gov. Paul LePage said he was saddened to learn Tuesday that Snowe would not not seek re-election. Snowe’s announcement is a boost to Democrats who suddenly have a shot at a seat that was widely considered to be relatively safe for Republicans. Democrats now hold a 51-47 majority in the Senate with two independents who caucus with the Democrats. Democrats are trying to hold on to seven seats in which the incumbents are not seeking re-election. Republicans now are fighting to hold three open seats, including Snowe’s. The announcement leaves D’Amboise of Lisbon Falls as the sole GOP candidate at the moment for Snowe’s seat after Dodge of Harpswell announced on Feb. 21 that he was unenrolling from the GOP and would run as an independent. Four Democrats — former Secretary of State Matthew Dunlap, state Rep. Jon Hinck of Portland, state Sen. Cynthia Dill of Cape Elizabeth and Benjamin Pollard, a Portland home builder — will compete in a June primary. But Charlie Webster, chairman of the Maine Republican Party, was among many on Tuesday who predicted that Snowe’s sudden withdrawal changes everything in Maine’s Senate race and potentially the two U.S. House races as well. Maine’s two Democratic U.S. House representatives — Michaud and Pingree — are eyeing Snowe’s seat now that she is stepping aside, as is Raye, the Republican Senate president who served as Snowe’s chief of staff in Washington. Michaud was the most forthright about his ambitions Tuesday. “I’ve been extremely humbled by the outpouring of encouragement I’ve received from all over our state to run for the Senate,” he said in a statement..
“In light of Olympia’s decision, my wife Karen and I will carefully weigh our plans for 2012,” Raye said in a statement. Pingree also left the door open to a Senate run. “This upcoming election is critical to the future of our working families around the country, and in the coming days I will carefully consider how I can best serve the people of Maine,” she said in a statement. The clock is indeed ticking for other candidates to jump into race. To qualify for the primary ballot, candidates for the Senate must submit 2,000 petition signatures from registered Maine voters to the Maine Secretary of State’s Office by 5 p.m. Thursday, March 15. Christian Potholm, a longtime political observer, author and pollster at Bowdoin College, said he was “very surprised” by Snowe’s announcement, adding that he believed she likely would have won re-election with 60 percent of the vote in both the primary and the general election. “I think it is too bad for Maine and bad for the Republican party,” Potholm said. He predicted Snowe’s decision could “open things up” in the Democratic primary for Snowe’s seat and could affect the Republican ticket as well. Indeed, the Democratic Senatorial Campaign Committee — the party’s national campaign arm for U.S. Senate seats — wasted no time on Tuesday declaring Maine as a key battleground. Snowe earned a reputation as an independent voice in her 33 years in Congress, but was frustrated by the sharp partisanship and gridlock that has come to characterize the upper chamber recently. She was the only Republican who voted for a version of President Obama’s health care overhaul, joining Democrats and casting a vote for the plan in the Senate Finance Committee. She came under intense criticism from conservatives, even after she voted with the GOP to oppose the final legislation. She epitomized the Northeast centrist Republican, a rare breed in a Senate increasingly dominated by Southern Republicans. Republican Sen. Scott Brown of Massachusetts called Snowe a voice of reason in the Senate. “We all are going to miss her independence and her ability to build bridges on some of the toughest issues,” he said. Snowe first was elected to the Maine Legislature in 1973, filling the position after her first husband, Peter Snowe, died while in office. She became the youngest Republican woman in U.S. history to be elected to the U.S. House of Representatives in 1978. Snowe won election to the U.S. Senate in 1994, becoming the first woman to serve in both chambers of Congress and a state legislature. She has never lost a re-election bid. Correction: An earlier version of this story referred to Andrew Ian Dodge as a Republican challenger to Snowe. Dodge unenrolled from the Republican Party after recent caucuses.